The wireless Oculus Quest offers six degrees of freedom and Touch controllers without the need of an accompanying PC, phone, or any external sensors. Breakthrough inside-out tracking has meant that Oculus can eliminate the external sensor array. It is explained that four ultra wide-angle sensors in the headset and computer vision algorithms are used to track your exact position in real time. Without wires and without the room limitations you will enjoy greater immersion, presence, and mobility, plus the ability to go beyond room-scale (to 4000sqft+), says Oculus. Furthermore, Oculus has implemented Guardian, to help you stay safe in VR. 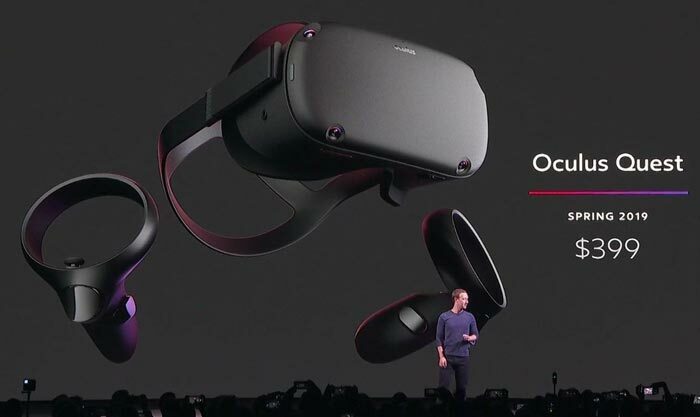 Importantly, the Oculus Quest is said to be a step beyond the usual mobile VR experience and at launch it will support 'Rift quality' experiences from launch in over 50 games. Titles that will be available include the popular Rift games like Robo Recall, The Climb, and Moss. Talking comparisons, the Oculus Quest includes the same screens as seen in the Oculus Go, with a resolution of 1600 x 1440 per eye, plus the option to adjust lens spacing. It includes built-in speakers with improves quality and deeper bass than the Go. The supplied controllers look a lot like the Rift's controllers and have the same button layout - but with the loop positions above, rather than below your hands. At this stage we don't know anything about the processing power behind this self-contained wireless VR system. At the unveiling event last night Oculus VR head Hugo Barra said this 'made-for-games' system offers easy porting of games between this new platform and the Rift. Lastly, Star Wars fans might be thrilled to know that Vader Immortal: A Star Wars VR Series will debut on Oculus Quest when it launches in Spring 2019. A teaser trailer has been released for the first VR game experience. If you are interested in VR games coming to the Rift it is worth visiting the Oculus YouTube homepage to see trailers for Defector, Lone Echo II, Final Assault, and more from the OC5 event. I just want a really cheap headset for my PC… Still cost more than a decent monitor! You are buying a pair of 1080x1200 90Hz monitors, with lenses, tracking systems and vr controllers. Having said that, I do most of my gaming sit-down in driving games and Elite. I believe for that sort of use you can actually plug a PS4 headset into a PC with a program that costs 15 euros. The PSVR is more of a mass market product and probably shows how cheap they can be made atm. CEX seem to have them second hand at £145 for just the headset.